It is not often your 15-year-old headlines at a real gig, so I thought I’d proudly share my Saturday with you, despite it turning out to be a long nine and half hours of combined taxi-ing Ed and waiting around, all for a twenty-minute performance of heavy rock. I felt like a real groupie, albeit an old and rather tired one. Much as I love our French village life, the older Ed gets the more I realise village life with teenagers has certain drawbacks and the running around is certainly one of them. I will be honest, I wasn’t looking forward to it and had resorted to bribery – I’ll make you (myself) coffee and walnut cupcakes, if you’re (I’m) brave enough to go. They helped, they really did and the bonus is that there is enough to share (with myself) this week too. 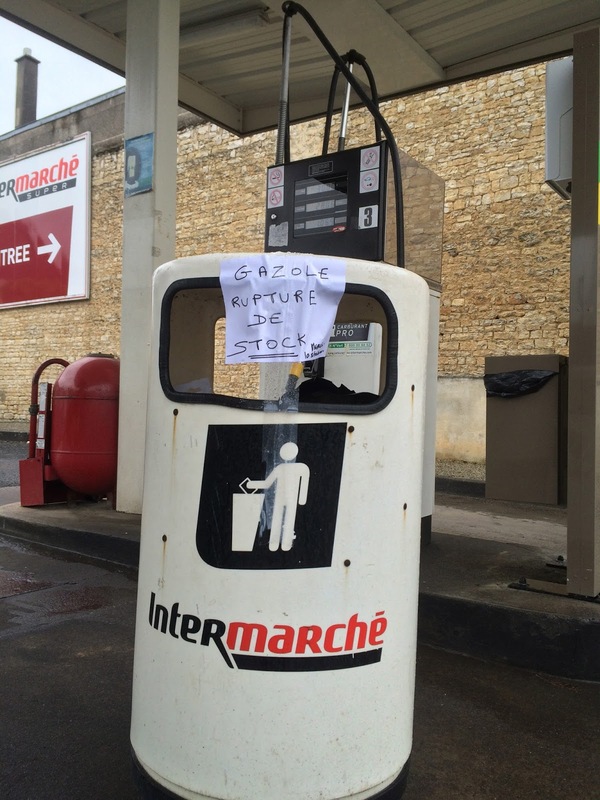 The current fuel issues in France, where thousands of petrol stations have run dry due to industrial action at the fuel depots, plus the threat of a big storm, had all added to my pre-event worrying, but I’m pleased to report it actually all worked out for the best and there were even a few nice surprises. I decided that to drop Ed off, go home and then return to collect him later, which would mean an extra 50 km of driving, would be a waste of fuel. To occupy my time when he was at his first rehearsal, I went on a fuel treasure hunt and rather undramatically found fuel in the first supermarket I tried and unbelievably there were no queues and no restrictions, so I filled up the tank, with a rather smug smile on my face and scoffed a cupcake as my reward. I have since read a lot of online criticism of people ‘panic buying’ and filling up before they would usually and I’ll admit that yes, that was me! You see I’m actually a lazy wimp. I still mourn the loss of the lady who used to fill my car up for me at our local supermarket, replaced by a machine that is happy to take my money, but offers nothing in terms of service and so we seem to have slipped into a routine. On our way to the airport Adrian fills the car with diesel, I then drive happy, easily covering about 80km a week just running Ed around plus the return trip to the airport, which could be anything from five to ten days later, without having to soil my hands filling up and Adrian sorts out the fuel on his return. So you see, filling up his mucky diesel was quite an accomplishment and unscheduled, but the last thing I want is not to be able to collect him from the airport later this week – obviously assuming the air traffic controllers will let the plane fly. Planning any form of travel in our poor troubled France (except by bike) is quite tricky at the moment. After the excitement of the fuel it was a long and lonely afternoon of waiting, mostly sat alone with nothing but an empty chair, my ipad, my notebook and my cupcakes for company. Then I found a friend, a French lady I used to do yoga with but hadn’t seen for over a year. This was a lovely surprise and it was so much nicer to be sat at a table with someone to watch the much-anticipated cabaret that Ed was performing in. However, it was like no cabaret event I had ever been to before and I’m not sure TV talent show judge Simon Cowell has ever had to sit through quite what I had to sit through. Although the wind and rain arrived during the evening, the storm and power cuts that hit at home missed us. The drive home, with the clock ticking ever closer to 1.00am was very dark (despite the full moon), very quiet and on roads strewn with the debris of trees and hedgerows that had been bruised and battered by the storm. I was so pleased to get home, I treated myself to another cupcake and collapsed into bed.